Visions of Donna Reed floated in my head as I sewed this apron from a 1950 re-released Simplicity pattern. When I looked in the mirror I saw Aunt Bea. What a reality check. It is still a cute apron; I am sure Clara would be jealous. The detail photo shows the brown bias trim that finishes all the seams and edges. I liked the fabric which of course I bought on sale. We would save so much money if there weren’t so many fabric sales. I bought a yard and a half to have the length I needed and was able to squeeze out four additional squares to make the matching pot holders. I didn’t know how to set up a better photograph and still show the shape of this apron other than putting it on the dress form. 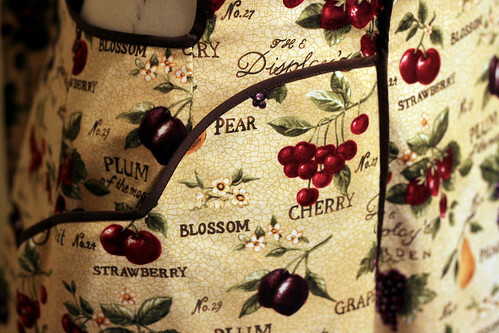 I have another apron to show tomorrow, I’ll work on finding a more artistic way to photograph that one. 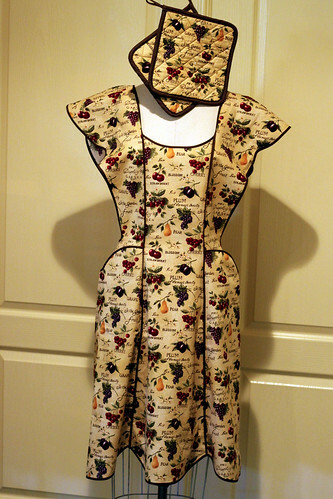 This entry was posted on Wednesday, July 15th, 2009 at 3:00 am and is filed under Sewing and Vintage. Tagged: Sewing, Vintage. You can feed this entry. You can leave a response, or trackback from your own site. I *love* *love* *love* it!! The fabric choice is perfect and the piping/bias tape is so well done – it really adds a lot to it. What a lovely apron! Will you be wearing it? Everyone, Thank you for your kind comments. Yes, I will be using this apron. It fits well and the skirt is really full and wraps all the way around in the back. Oh, CUTE! I love it! I have a new thing for aprons lately, LOL! That one is darling!